Prague, Czech Republic. 2nd May 2014. 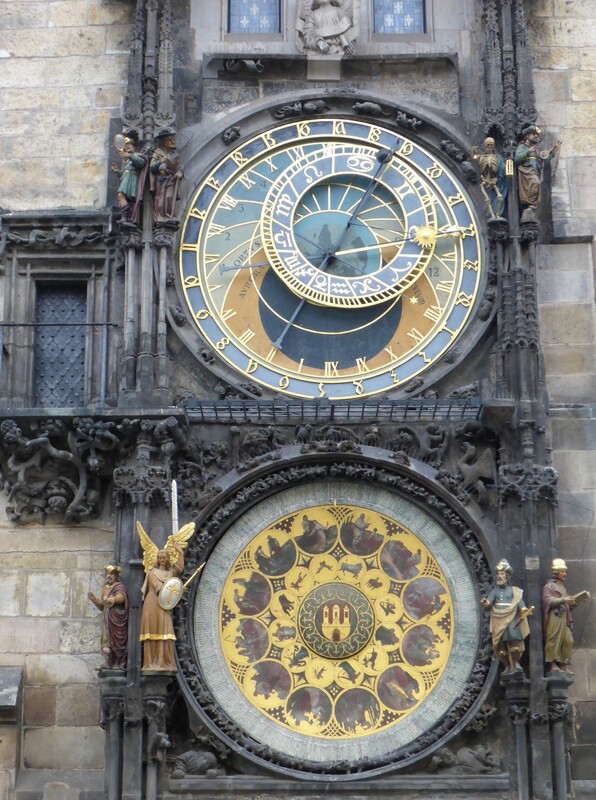 The thing about Prague is that it almost seems as if history designed it for tourists. The transportation system is easy and cheap. 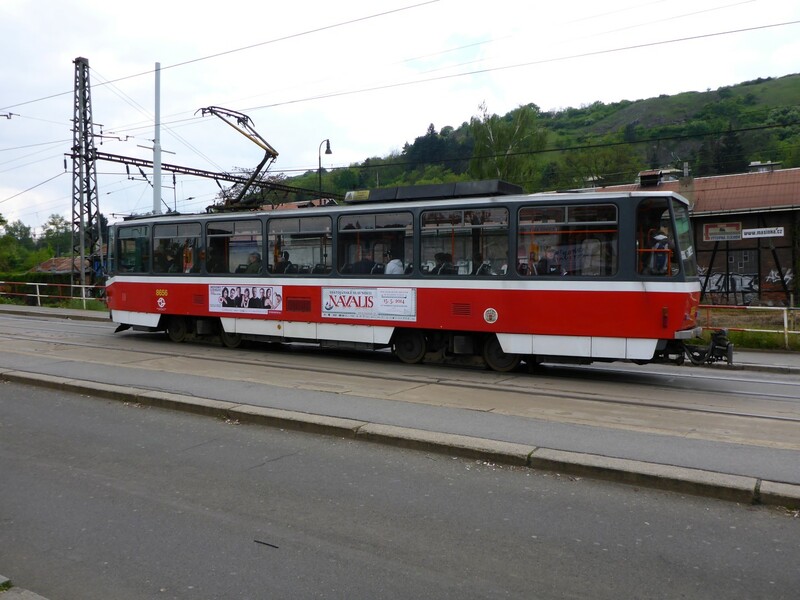 There are trams, buses and trolley buses. The essential sights are all contained within one relatively small area. The cafes and restaurants are plentiful. Food and drink is both good and cheap. I know the former kings of Bohemia did not have 21st century visitors in mind as they developed the city over the centuries but I know I was grateful for nearness of everything. 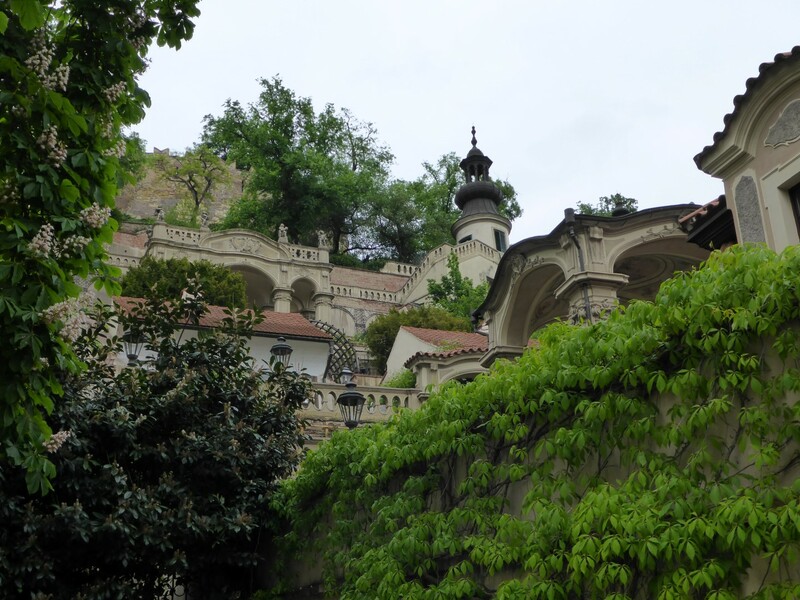 I got off the tram by the Old City, looked at my tourist map and decided to walk up the hill towards the castle. As it was a bit late I didn’t go to the castle itself, deciding to save that for the next day. Instead I walked up to the Loreta Chapel that was near to it. On the way up I dropped into a rather nondescript church which, when I got inside, turned out to be very ornate indeed, with an amazing alter piece and other shrines around the side. The exterior completely belied the beauty of the interior decoration. Typical of the general architecture. The beautiful interior of an otherwise non-descript church. On the walk up I was fascinated by the quality of the general architecture of the normal buildings in the street, mostly late 19th century Art Nouveau, all painted in pretty colours with decorative window and door surrounds. As I approached the top of the hill the facade of the Loreta seminary and monastery buildings came into view, very imposing as they looked down upon me. The first view of the seminary as you walk up the hill. The front view of the Loreta. The Loreta Chapel was built in the 17th century and is mostly Italian Renaissance with a later Baroque front added to it. It’s famous for its peal of 30 bells which chime every hour. It is also a pilgrimage site of some note. 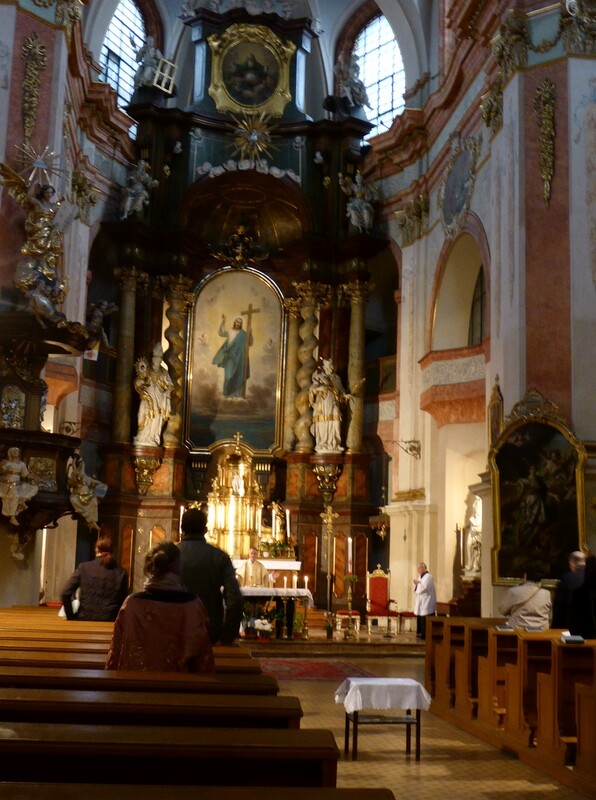 I had a look inside the church and was, once again, amazed by the quality of the decoration. Not only the alter pieces but also the ceiling paintings which were incredibly detailed and beautifully coloured. A brilliant example of the painter’s art. The building also houses the Loreta Treasure, an apparently world renowned collection of ecclesiastical treasure. 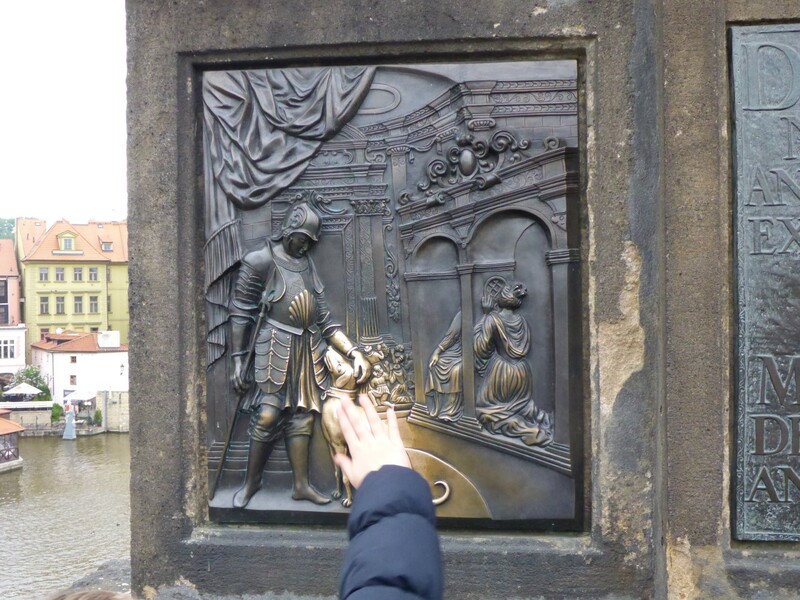 A nice introduction to some of the history that Prague holds in store. 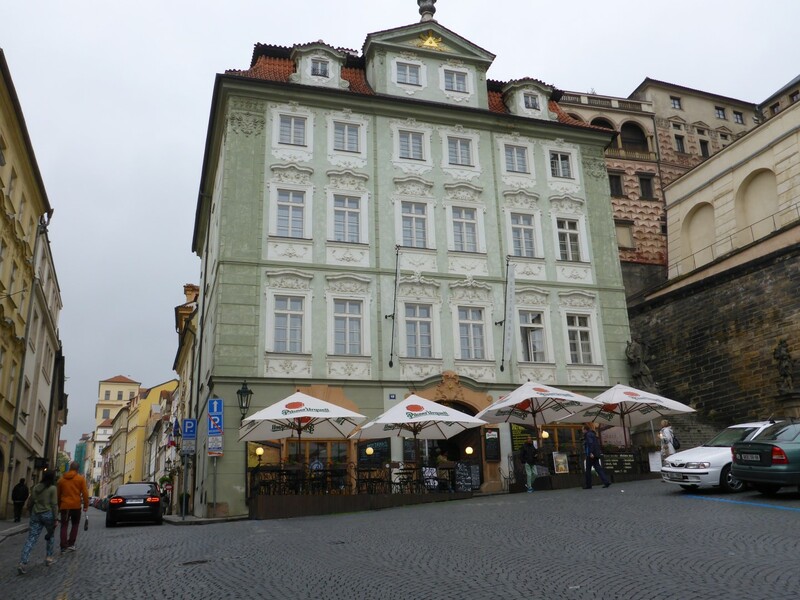 Another thing that Prague holds in store for the visitor is cobblestones. By the time I left the city I still hadn’t decided whether walking up them or down them was worse. Big ones on the road, small ones on the pavement, I don’t envy wearers of high heels. By the time I’d got down the hill again it was time to eat and I’d almost decided that going down the cobbles was worse. But final judgement was reserved. A good meal at a nice restaurant for a decent price was all I needed to recover and a fine example of Czeh cooking it was. If some one offered you cabbage soup you’d probably say ‘Where do you think we are, in the workhouse?’ In fact, it was delicious. Cabbage tasting, of course , but with all sorts of other vegetables in it too. Followed by half a duck. After that I needed the walk I took around the area at the bottom of the hill, admiring the buildings, such as the opera house, before catching a tram back to the campsite and a not very warm tent. On the way into Prague I had seen a shopping area that looked very modern so I stopped off there on my way into the city next day. CZ is the first former communist country I’ve ever visited and I’m curious to know what has happened since the Velvet Revolution. I had noticed on my way into Prague that some towns had a generally shabby air around the edges, with industrial buildings in particular sometimes looking a bit run down or unused. I figured that the state of a nation’s shopping could also give a useful clue to progress. This area, called Andel, had no shortage of modern shops and supermarkets. There was also a very modern three storey shopping centre, with international brands such as Tommy Hilfiger, Calvin Klein and Nike along with some British brands like Next, M&S and a huge Tesco. There were many shops with local names too, including one that sold tight fitting men’s and women’s underwear called Immodesti. I’l leave it to your imagination as the what the display was like! On the third floor was a cinema and loads of restaurants, many of them fast food but some a little slower. Out on the street was a KFC and a McDonalds. This area seemed to be a ‘go to’ destination for Prague-ites as it was busy with shoppers. Onwards to the old city, destination Prague castle, which sits on top of a very steep hill, the same one I struggled up yesterday. At the bottom is the entrance to the terraced gardens which sit on the south side of the hill below the castle. These were designed and built in the 17th and 18th centuries to an Italianate design and had many different areas in them. There were Orangeries, Loggias, baroque frescoes, a sundial and fountains, among other features. They were for the use of the nobles who lived in the adjoining palaces. The walk up through them was very interesting and pleasant and although there were plenty of steps, there was not a cobblestone to be seen. The Italianate terraced gardens on the southern slope. A fine example of Baroque architecture. Arriving from the gardens up to the palace square, the ‘wow’ factor is huge. The Baroque frontage of the Palace/Cathedral is something to behold. The picture tells it better than I can. I paid my fee to climb up the 285 steps to the top of the tower and was glad I did as the view over the city is fantastic. I could see for miles and one thing that struck me straight away is how there are no modern buildings in the historic part of the city. Not a skyscraper or tower block to be seen. The newest buildings are late 19th century and all of those are low rise. Boris, please take note! View over Prague from the top of the cathedral. She could have rubbed all day but nothing was going to happen. More likely to fall off than anything else! The history of the city matches that of the castle. There has been a castle of some kind on the hill since the 8th century and the city has grown around it, first on one side of the river, then the other. The current castle dates from the 14th century but most of the buildings are from the 18th , especially the additional ones. 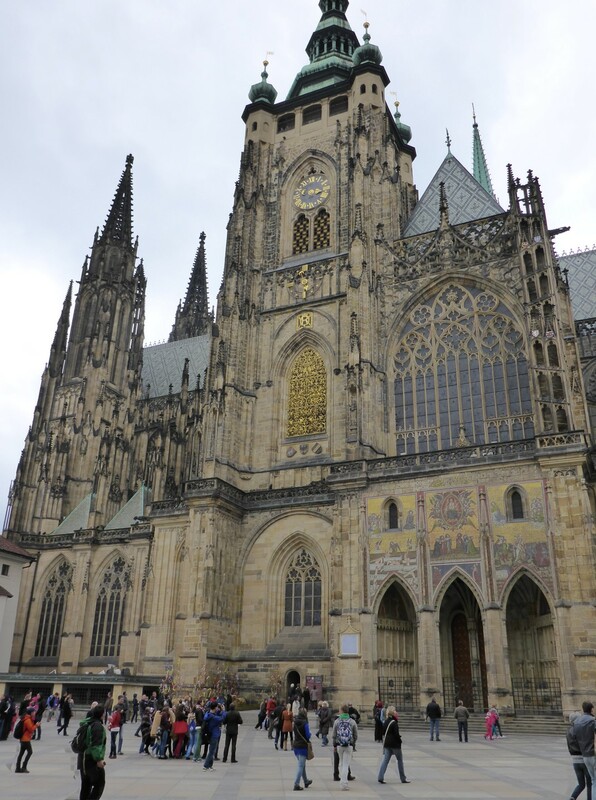 Dedicated to St. Vitus, St. Wenceslas and St. Adalbert, it’s the cathedral part of it that is particularly striking and this building was were the kings of Bohemia were crowned. The other palace buildings were home to kings, princes and presidents. A walk back down the hill to the Lesser Town Square, with a coffee break at the bottom. This square contains some fine buildings, including St Nicholas Church, an 18th century building in a distinctive style known as Prague Baroque. I didn’t go inside that one, I think I was a bit ‘churched out’ by then. Then time to cross Kulov Most, the King Charles IV bridge. Built in the 14th century, this bridge is one of the last remaining examples of a medieval bridge in Europe. There are three towers protecting it, one of which is reckoned to be the most astonishing civic Gothic building in the world. Two are on the left (or west) bank, the other on the right. It has sixteen arches and thirty statues along its edges, all religious figures of some sort. There are a couple made of brass, which everyone rubs as they go past. One or two of them are quite graphic in their portrayal of their subject matter too. They from a kind of avenue of statuary for the tourists to walk past. 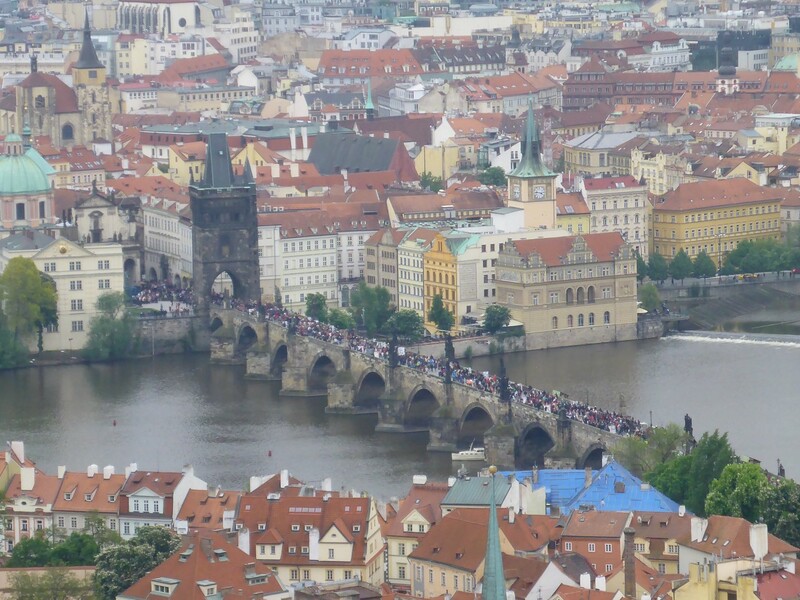 It’s no wonder it is one of Prague’s UNESCO world heritage sites. In fact almost every time I read about one of Prague’s building I spotted that acronym somewhere in the write up. Charles IV medieval bridge, busy with tourists. Tourists. Thousands of them. From all over the world as far as I could tell. All on the bridge where I’m trying to take photos. I’m sure they were saying the same about me too. But it was astonishing how many people there were in the city. To entertain the tourists there were a couple of busker outfits on the bridge. 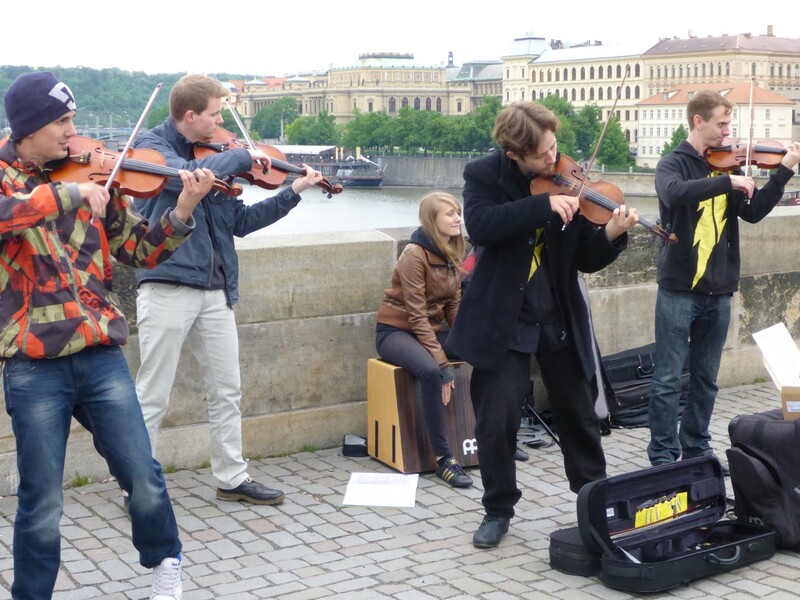 One was a quartet of young violinists playing pop songs, and doing it very well I thought. The other was a Trad Jazz Band, playing some tunes, also very well. Both had CD’s for sale, standard price of EU10. I wasn’t tempted to buy but was happy to put some change in the collection of the Jazz combo. There’s some unhappy people in there. Another place to rub for good luck. The route from the bridge to the town square twists and winds along some narrow streets. A cafe/bar on almost every street corner, a gift shop of some sort right next to it. This truly is a place for tourists. Onwards into the square of the Old Town. This is where several of Prague’s most interesting buildings lie. The Old Town Hall looks fabulous and has, as it’s main attraction, an astronomical clock, dating from 1410, known as the Orloj, The world’s third oldest but the oldest working example. It is designed to tell the time, the date, the phases of the moon and all sorts of other useful information. It even shows the time of the sunset throughout the year. The slight flaw with it is that some of this information is only completely accurate when the 1st January falls on a Monday. But, like me, I bet you wouldn’t notice the error however long you stood and stared at it. It’s been renovated and repaired many times in its life, the latest in 2005 and looks simply amazing. It’s possible to go up the clock tower. Me, I can’t resist a spiral staircase so up I went to get a great view over the town. I think buildings often look better from above because you can see the whole of their facade and get a more three dimensional view of them. They fit better into their surroundings and make a bit more sense than when seen from the ground. On the way back down I enjoyed reading about the history of the clock, depicted on a series of information panels alongside the staircase. I also discovered the story of the First Defenestration of Prague. I’d heard this word before and new it involved windows and was fascinated to learn more about it. A ‘defenestration’ is when something is thrown from a window. In this case it was the Judge, the Burgomaster and thirteen town Councillors who flew forth, none of whom survived. 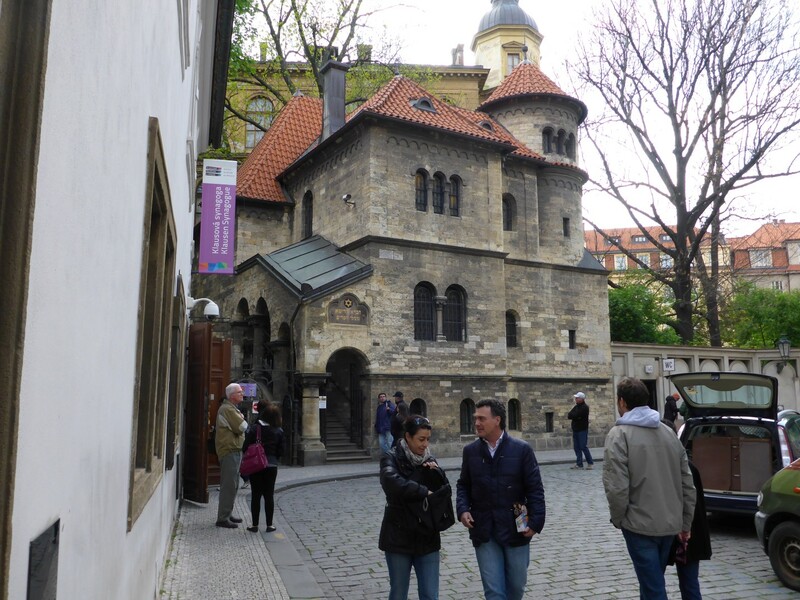 It happened at the hands of an angry mob who wanted a supporter of Jan Hus, a church reformer, released. A stone was thrown at their leader from a town hall window so the mob stormed the building and took their revenge. The ensuing Hussite wars led to twenty years of trouble for Bohemia and Prague. On the other side of the square is the Church of Our Lady Before Tyn. Completed in 1510, it’s another fine example of Baroque architecture with rich interior decoration spanning several centuries. One of the great things about restaurants in Prague is that they’ll often have fixed price, three course menus. Having pushed the boat out last night by having roast duck, and spending all of £12 on a three course meal, I thought I’d save a bit of cash and only spend £6 tonight. So that’s what I did and still ate very well indeed. Tonight felt even colder than the previous one and when I checked the thermometer on the office wall it showed 4oc. No wonder I needed my woolly thermals. I kept warm by cursing all the tourists who where occupying those nice warm hostel beds. The morning started out with a bit of bike maintenance – tyre pressures and so on. While doing so I saw that a couple of my tools had got damp and rusted, in particular my feeler gauges. Not vital right now but a job to put on the list for base camp back in the UK to sort out some replacements for me. Back onto the tram on a sunnier day than of late, but still with a bitter wind. I stopped off at the shopping centre at Andel again and went up to the food court to try one of the food outlets. I settled on a place that seemed to sell a combination of Chinese and Mexican food, judging by the pictures of it anyway. It’s so easy to just point at a picture and mumble at these places. You’ll always end up with something edible – some kind of pork noodles and veg in this case. 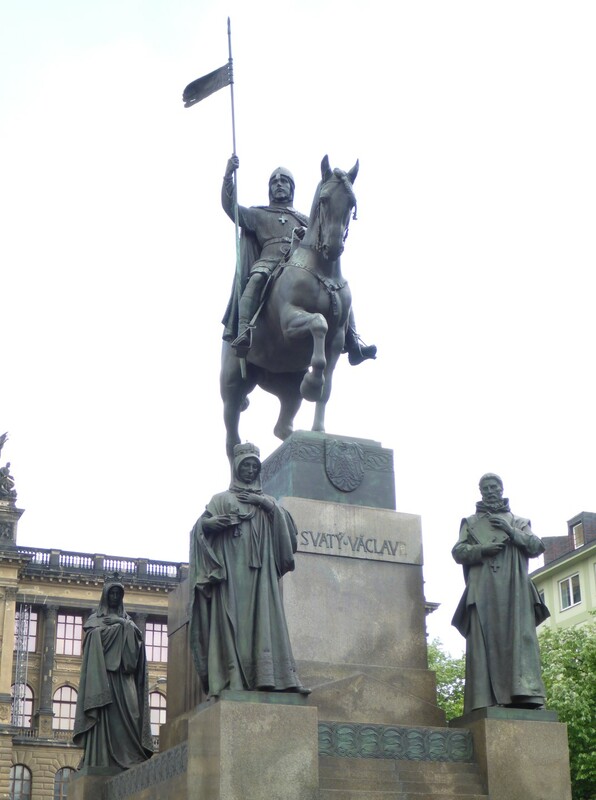 One of the key sights yet to be visited was the statue of King Wenceslas, in Wenceslas Square. He was the Duke of Bohemia in the 10th century and not long after he was assassinated he was declared a martyr and made Patron Saint of the country. He was also posthumously awarded a kingship. A cult grew up around him in both Bohemia and England. How ‘good’ he actually was is a matter for speculation but he was reckoned to be a decent and educated man, for his time. The legend is that he would get out of bed most nights and go to the church and give out alms to the poor. The statue was erected in the 19th century, at a time of Czech nationalism, and placed in the square, which was named after him. It’s a magnificent piece of sculptural work and has been the focal point for many of CZ’s celebratory moments, not least during the Velvet Revolution. I spent the rest of the day walking around visiting various sights, including the 13th century synagogue. I revisited the Town Square and Charles Bridge, still fascinated by the amount of tourists and how much they were enjoying themselves. Prague clearly has a wide appeal. 13th century synagogue, the oldest in Europe. View of the castle from the New Town. While walking around the previous evening I had seen stalls selling some kind of Czech sausage, clearly a local delicacy. So I went looking for one. You know what I’m going to say – none to be seen. So I hopped a tram back to Andel, where all the shops are, thinking there might be one there. No luck. The end result was that I had KFC for my evening meal, and I felt very ashamed. It tasted no different to what I’ve had before at home. What a cop out! Something I’ve discovered about tourist offices is that they’ll always have a decent map of their area, usually including some information on the worthwhile places to visit. Prague is no different and the very useful thing about the map I bought from them is that it also gives information about places to visit in the rest of the country. This very useful feature enabled me to plan the rest of my stay in CZ, having arrived in the country with no plans other than getting to Prague. So back to the campsite, determined to get up and away in good time the next day. Destination Hradec Kralov! 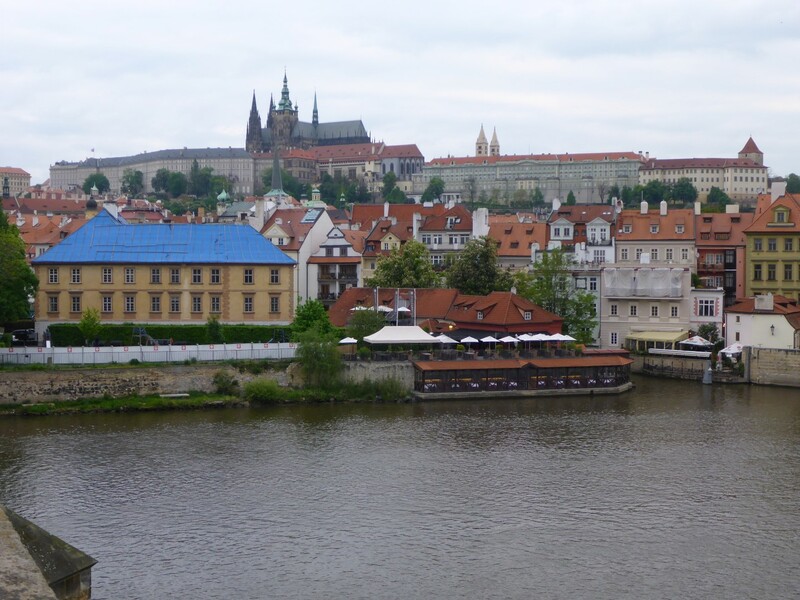 What did I think of Prague? A very lovely and historical city, dating back to the 9th century. It had been, at times, the seat of power of central Europe. It all began with a castle on the hill around which a town grew. The castle was replaced with a cathedral/castle, the seat of the kings. One of the most important of these was Charles IV who built the bridge and developed the new town on the other side. 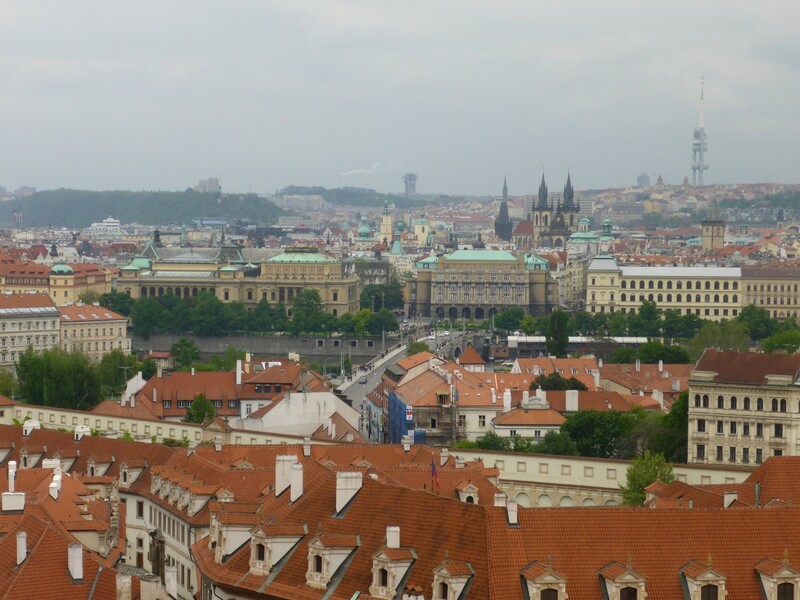 Prague is described as ‘the city of 100 spires’ and it’s easy to see why. There are churches in abundance, as well as the cathedral, and even the important town buildings all seem to have a spire or two. The architecture is a wonderful mixture of Baroque, Italianate Renaissance and art nouveau. The city has been one of central Europe’s important centres of science, art and religion over the centuries and there is a rich legacy of all three of them to enjoy. When you add in the tourist orientated infrastructure, the excellent transport system and the great exchange rate, Prague becomes a ‘must visit’ destination. I really enjoyed my time there, despite the weather. Go. Now. Thanks David. You never know, that might just happen, if I can sit still long enough. Excellent descriptions Geoff, thanks for sharing. Keep them coming. Safe biking. Thanks Graham. More to come, when I can find the time. I really am impressed with your literary style. Easy to read and informative. A career in travel journalism awaits you. All the best. Well thanks John, that’s high praise indeed. I enjoy writing it although it does take time. I’m heading to Poland next week so will follow up your request as best I can. Great piece of writing. I don’t need to visit Prague now, I feel as if I have already been there. Thanks jane. I hope Chris had a good time.